by Stephen King, 1978/1990, 1153pp. Audio version read by Grover Gardner. TLDR: 4 out of 5 for wonderful characters and great storytelling. This was my first Stephen King novel. I've seen a number of movies based on his books, but have never dipped into his text before, mainly because I thought his stuff would be NYTimes bestseller material, which usually isn't my kind of thing. But I've often heard people say The Stand is a great book, and when I first joined Audible there was this mega version available and my Scottish side said "Hey - so many hours listening for a single credit! Great Value! ", so I picked it up. Snobbery and Frugality aside, it was a great value. I really enjoyed the story, and even more than the story, i enjoyed the characters! I have to say, King has his finger on the pulse of everyday America. His characters feel like real people - patriotic, confused, flawed, usually kind, and even the-bad-guys-are-kinda-well-meaning kind of people. What kind of characters? The Stand features a messianic grandma of colour, a character like Wilson from Home Improvement, a small-time thug dragged into bad behaviour by his companions, who later becomes a responsible adult when he finds a cause (it's the wrong cause, but that makes him all the more real! ), A deaf-mute, an extremely likeable guy with learning difficulties who saves the day, a one-hit-wonder rock star who is trying to be more than what his mother always said he would be, a nerd whose a wannabe author, a young pregnant woman, another woman who is saving herself for the right man (i.e. the dark messiah), a ne'er-do-well pyromaniac, Kojak the dog, and many more. Yeah, this book has great characters, and they are absolutely brought alive by reader Grover Gardner in this audio version! This may be one of the few books where I'd recommend the audio version over the print version! King also writes great dialogue - believable, muscular, energetic! So, I still think I'm right in that King doesn't write literature, but man he gets people and can make them convincing. He's a great story-teller! An American Lord of the Rings? One thing I didn't know before starting this book is that King set out to write a long novel in the vein of Tolkien's The Lord of the Rings. People now often compare Martin's Game of Thrones to LOTR, but this book predates that. Does he succeed? Yes and no. It's best to think of The Stand as its own thing, rather than another LOTR. 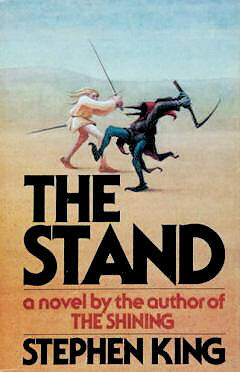 For one thing, The Stand takes place in America and doesn't concern itself with the rest of the world. There really isn't any world-building here, so either King didn't understand Tolkien's approach to myth, or just didn't care to emulate that aspect of Tolkien's work. The Stand does feature a conflict between good and evil, and here the models for 'good' and 'evil' are authorial conceits. They make no sense, in a way. They exist because "God and the Devil are now playing chess". They are interesting characters - and both Flagg ("the dark man") and the woman of colour representing God have their own character. But their quarrel makes no sense - they never even meet, but only know each other through dreams. Ultimately, the forces for good and the forces for evil meet, and the results are... messy! Which is rather how I like things! I won't say more for spoilers. The Stand is a great American post-apocalyptic story, with great American characters of the kind that Bowie and Bono would no doubt fall in love with. There's a satisfying story here, and messy but satisfying conclusion. It's not The Lord of the Rings, and comparisons to that book inevitably fail in such matters as language, history, and world-building. But as a longer, and very American work about the struggle between good and evil, it's pretty satisfying. Do you need the Uncut version (which is about 350 pages longer than the shorter version)? I'm going to guess probably not. Having only read the longer version, I can say that I feel there's lot's that could be cut. But even the longer version was never dull! A credit well-spent indeed! 4 out of 5.